英語のぺーじ YouTalk Newsweek Ends Print Edition. 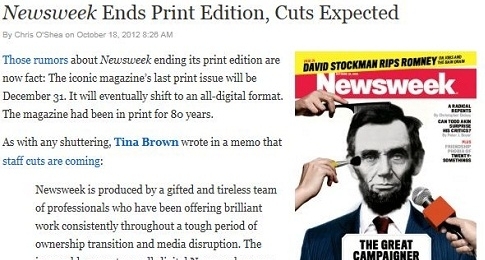 Those rumors about Newsweek ending its print edition are now fact: The iconic magazine’s last print issue will be December 31. It will eventually shift to an all-digital format. The magazine had been in print for 80 years.